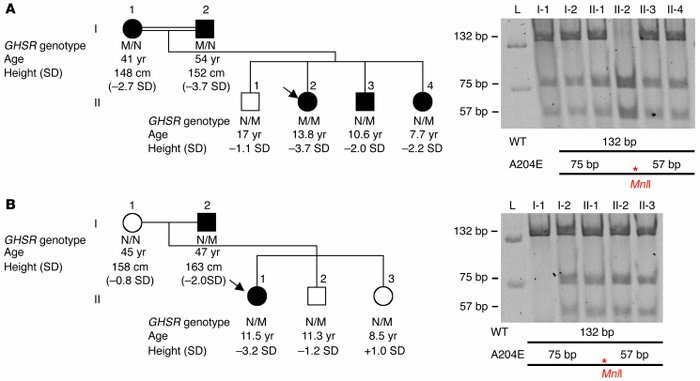 Inheritance of the A204E GHSR mutation in families 1 and 2. (A) Family 1. (B) Family 2. Circles and squares denote female and male family members, respectively. The SD to mean height for age is given below each symbol; height values are before GH treatment. Black symbols denote a short stature. The probands are indicated by arrows. The segregation of the GHSR A204E allele within both families was carried out by means of a specific restriction fragment length polymorphism (the A204E mutation creates an MnlI site).